Dependence on Maimonides and Gabirol. French scholastic; bishop of Paris from 1228 to 1249. He was one of the originators of Christian scholasticism in the thirteenth century. In his writings he displayed an extensive knowledge of Hebrew literature; and, although he never cites Maimonides by name, he was on many occasions influenced by the "Moreh Nebukim." Thus the anonymous Hebrew philosopher cited by Guillaume on the superiority of the matter of heavenly bodies ("De Universo," I., part i., ch. iii., p. 631) is none other than Maimonides (l.c. II., ch. xxvi.). Maimonides' work was frequently utilized by Guillaume, especially in the first part of his "De Legibus." He follows Maimonides' theories on the symbolism of the sacrifice worship and the rational motivation of the Biblical commandments ("De Legibus," xvi. 46; comp. "Moreh Nebukim," iii., ch. xxxi.). Starting with Deut. iv. 6, Guillaume, like Maimonides, concludes that, besides their exoteric sense, the precepts have an esoteric meaning (ib.). The numerous commandments were intended to divert the Israelites from certain ideas and customs which were in vogue among the idolatrous nations, especially from the teachings of the Sabeans (l.c. i. 24; comp. "Moreh Nebukim," iii. 388). Guillaume combats Maimonides' view that the sacrifice was to be considered only as a concession to the ideas of antiquity; but he accepts this view with regard to some prescriptions concerning the sacrifices (l.c. vii. 38; comp. "Moreh Nebukim," iii. 365). The Jewish philosopher whom Guillaume revered most highly was Solomon ibn Gabirol, whose "Fons Vitæ" he often cited under the title "Fons Sapientiæ." Gabirol, who was known to Guillaume by the name "Avicebron," was believed by him to have been a Christian who lived in an Islamic country. Guillaume was much impressed by Gabirol's theory of the will, which he considered to be the Christian "Logos." Thus, although he combated Avicenna's theory of emanation on the ground that God would not be the immediate cause of all created beings, he did not object to that of Gabirol which leads to the same result ("De Universo," I., part i., ch. xxvi.). Even when he deems it necessary to combat Gabirol's views, he does it without mentioning his name; e.g., when he objects to the theory that there are no immaterial substances, or that even the intellectual substances consist of matter and form (ib. II., part ii., ch. vii., p. 850). Guillaume's attitude toward the Jews was far from benevolent. During his bishopric and through his personal influence the Talmud was burned in Paris (1242). Nor did he spare the Jews in his writings. For him, the omission in the Bible of certain very important dogmas, such as the creation of angels, the immortality of the soul, etc., was due to the narrowness of the intellectual perception of the Jews and to their moral depravity. 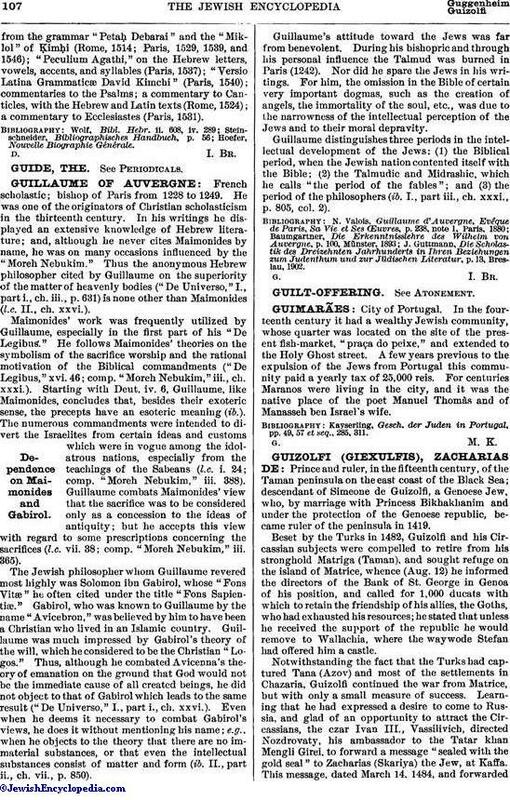 Guillaume distinguishes three periods in the intellectual development of the Jews: (1) the Biblical period, when the Jewish nation contented itself with the Bible; (2) the Talmudic and Midrashic, which he calls "the period of the fables"; and (3) the period of the philosophers (ib. I., part iii., ch. xxxi., p. 805, col. 2). J. Guttmann, Die Scholastik des Dreizehnten Jahrhunderts in Ihren Bezichungen zum Judenthum und zur Jüdischen Literatur, p. 13, Breslau, 1902.